First up for today, it’s a particularly bothersome animal, capable of annoying adventurers of almost any level. And no, it probably won’t be in combat. Player Characters tend to be pretty well prepared and equipped for that. 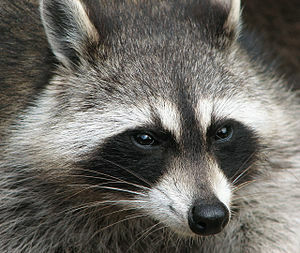 Dire raccoons are larger, and somewhat tougher, than normal raccoons – but their principle threat to most travelers lies in their tendency to sneak into barns, homes, and campsites and steal things. Usually it’s just food – but occasionally they swipe something which is really important. They normally range from four to six feet in length and can weigh anywhere from one to three hundred pounds – but such massive specimens are rare. Dire Raccoons can be summoned in the place of Dire Badgers with a Summon Nature’s Ally II spell. Clever Hands (Ex): Dire raccoons have functional hands, and are extremely clever about getting into places they’re not supposed to be and at disabling traps. Awakened Dire Raccoons are often known as “Tanuki”, and usually acquire illusion, nature, and transformation magic – although occasional clerical Tanuki are seen as well. In basic d20 they favor the Druid class. Now that is definitely an awakened animal that could be irritating with the rogue class or certain clerical domains (I’m thinking Travel and Trickery here, but I’m sure there are others). I suspect they still wouldn’t be TOO inclined toward combat, but magic and trap-making abilities mean the adventurers will have a hard time finding what the raccoon’s stolen. Or for that matter, just finding where the dire beast IS. Trickery and Travel would definitely be good choices though. Take a little luck to “take 20” on relevant roles and you’ve DEFINITELY got a serious pest.